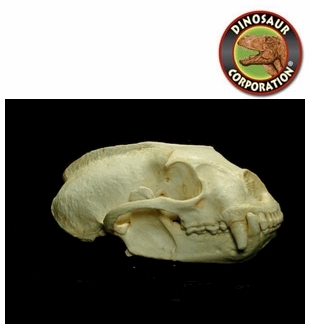 Tayra skull replica is cast from original specimen. Eira barbara. Carnivora/Mustelidae neotropi. Central Mexico to N. Argentina and Trinadad.. CAS specimen. The Tayra (Eira barbara), also known as the tolomuco or perico ligero in Central America, motete in Honduras, irara in Brazil, san hol or viejo de monte in the Yucatan Peninsula, and high-woods dog (or historically chien bois) in Trinidad is an omnivorous animal from the weasel family Mustelidae. It is the only species in the genus Eira. There are at least nine subspecies.